This program is a must-have for anyone new to the appraisal process and is a valuable reminder tool for those with more experience. It is a complete package designed to help both sides achieve positive results from an appraisal interview. For a manager about to conduct an interview, or a staff member about to be interviewed, The Appraisal Interview video and self-study pack (for appraisees) will ensure both sides understand the objective of an appraisal. It takes a look at the whole appraisal process, and provides a number of valuable behaviour do’s and don’ts to follow. 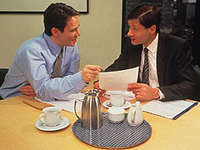 The program also emphasizes that the process is not complete once the interview is over. It is vital to monitor progress throughout the year, follow up on any issues that are raised, and use the past to reshape the future – putting what you’ve learned towards organizational performance and individual development.